(Sketch A No. 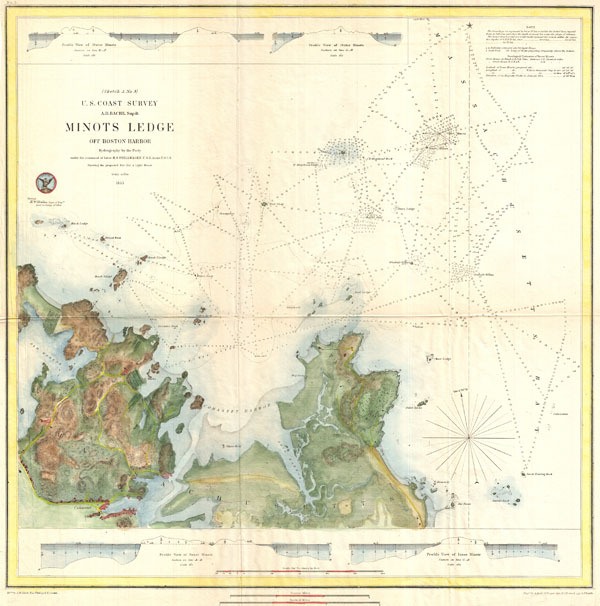 3) Minots Ledge Off Boston Harbor. A rare hand colored 1853 coastal chart of the Minots Ledge, just off Boston Harbor, Massachusetts. Features The Cohasset Salt Works, Old Harbor, Brig Harbor, The Glades, Cohasset Harbor, and various islands. Published under the supervision of A. D. Bache for the 1853 Report of the Superintendent of the U.S. Coast Survey. Report of the Superintendant of the United States Coast Survey, Washington, (1853 edition). Good condition. Blank on verso. Good margins. Minor discoloration on original fold lines.